Baby food is an interesting industry in civilized Western First-World society. 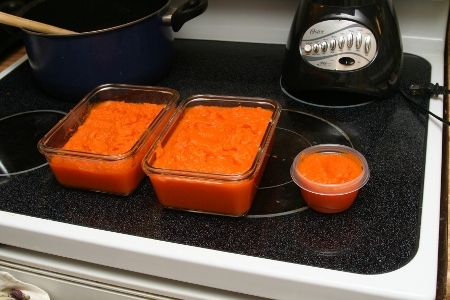 In this market, prepared food mush is jarred or otherwise packaged in special containers and advertised as food items to feed your baby. The product is shelved in its own aisle separate from the produce and meats that typically perimeter the grocery store as if to say this food is different than anything else. Think about it, we don’t have a separate food aisle for kids, adolescents, adults, or seniors. (but there is a pet food aisle). Parents (myself included) have purchased those cute baby food jars/tubs. One problem with commercial Baby Food is cost. Each jar/tub comes out to $0.59-$0.89 a unit, and the price varies on selection, marketed quality, and advertised sales. Procuring a week’s worth of food supplies solely on baby food adds up rather quickly. Food of unsure quality put there by a man* in a factory downtown, far far away. Food of perceived quality put there by a man* in a factory downtown, far far away. *when we say man, we really mean a man pressing a button on a machine, or a man on the floor in front of a control panel for a floor of machines, or a man in a operations center overseeing many remote factories of machines. To address Quality Assurance and Cost Efficiency, we at EAF have started doing the revolutionary in feeding our baby, by making our own baby food! If a re-occuring theme ever appears on EAF, its that if you want something done right, you have to do it yourself. 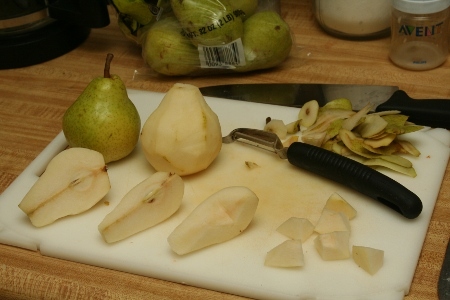 Making our own baby food has yielded great results and doesn’t significantly impact overall daily schedule due to the relatively simple procedure. Procure food item(s) in fresh unprocessed state (be it from your back yard, UV lit closet, Farmer’s Market, or neighborhood grocer). You may balance quality vs cost based on your preferences. In contrast, peas are the easiest. Open up a bag of freshly frozen peas. Go to Step 2. Our feature today, Carrots, fall in the middle. Peel and dice. 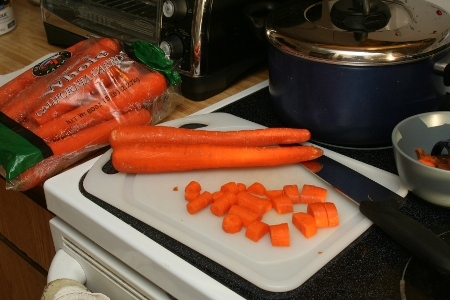 With the Food Item cut, prepare a pot and colander for steaming Food Item. Load the pot with just enough water to generate steam with enough margin so that entry of boiling water into colander is minimized. If colander has a stand, using a extra standoff rack may help. Rack helps bring food to a higher level. Load colander into pot with Food Item. 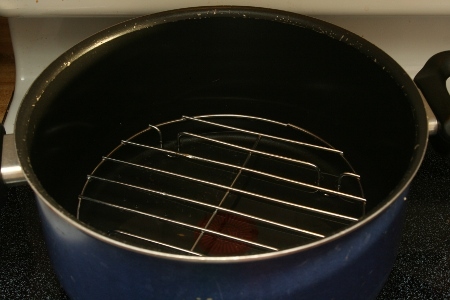 Steam the Food Item at a moderate heat. (The objective is to generate just enough heat to produce steam). Steam until food is a little softer than what normally is served on an adult plate, but not as soft as school cafeteria food. 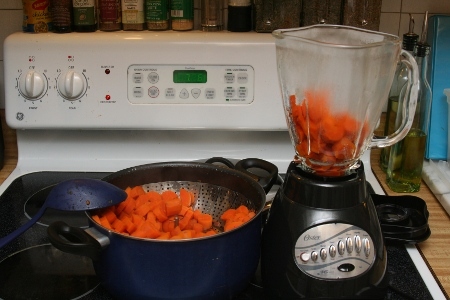 Transfer steamed Food Item into Blender with some resultant boiled water. Blend the Food Item until satisfactorily pureed. 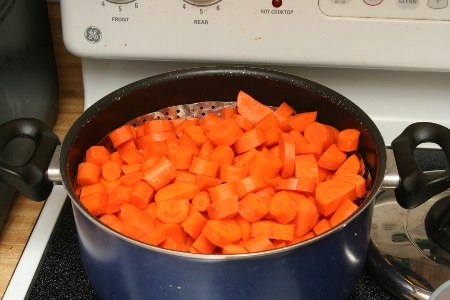 Add additional resultant boiled water if needed. Upon completion of blending process, pour food item mush into food-grade containers. We're currently short on the single-serv containers. Falling back on bulk storage. 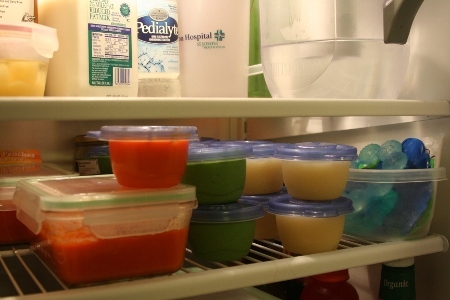 Unlike the shelf-stable commercial baby food that may last in its container for years, the Custom Baby Food Solution requires refrigeration. What's cooler than being cold? Ice Cold. Cost? The price of acquiring the fresh Food Item chimes in at $1-$3 and yields 7-10 “baby servs”, compared to 2-4 jars of the commercial offering at similar price. Quality and Feedback on Voice of the Customer? Baby loves the Custom Baby Food Solution and can’t get enough. The Engineers in the home verified that the Custom Solution has a more vibrant taste than commercial offerings. Not that the commercial baby food is bad. Just that while the commercial baby food peas have pea, carrot, or pear taste, the Custom Solution screams I AM A REAL [PEA/CARROT/PEAR]! All Content Copyright (C) 2011 Engineering A Family. All Rights Reserved.